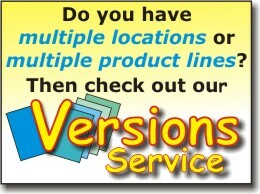 Versions Service - economical custom versions of your newsletter from a single custom Master! 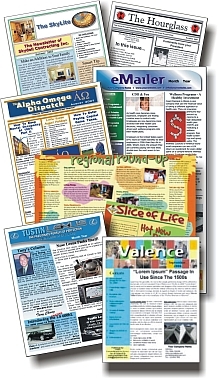 If your organization has multiple locations or product lines or agents, it could be really costly to produce a different newsletter for each one of them. But not with our economical Versions Service. After completing the Master layout for each issue, for just a little more we'll create a customized Master for each of your locations, product lines and/or agents. Then optionally we will print and deliver them to each location, or distribute them to your mailing list by USPS bulk mail and/or online. For as little as $30 per Version each unique Master can include their specific contact information. If you wish, location name, address, telephone, web and eMail address can appear on each page of every issue. For as little as $50 per Version each issue can include custom content specific to that Version. It could be a Personal Column with a photograph, an introduction to the staff, or maybe news about interesting local events. Click HERE if you would like more information on our Versions Service.